Two front page headlines based on figures from the Office for National Statistics caused confusion this week. The Daily Mail, which is usually eager to push the Boozy Britain narrative, led with the news that the number of Britons who exceed the government’s drinking guidelines has fallen significantly. The Independent, by contrast, ran with the news that alcohol-related deaths have reached an all-time high. Who’s right? Actually, both of them are technically correct. They are based on ‘Statistics on Alcohol, England’, an annual ONS/NHS publication that does what it says on the tin. It shows that the proportion of adults in England who consume more than 14 units a week fell from 26 per cent in 2011 to 21 per cent in 2016. It also shows that the number of alcohol-specific deaths – mostly alcoholic liver disease – has risen to 5,843, the highest on record. I say technically correct because the number of deaths is affected by the size and demographics of the country. A more appropriate measure is the age-standardised mortality rate. By this measure, the alcohol-specific death rate was 11.1 per 100,000 in 2017, exactly the same as in 2008. The ONS notes that the mortality rate has ‘remained broadly similar since 2007’, but the Independent did not consider this to be newsworthy. Nevertheless, the mortality rate in 2017 was the joint highest on record and there is no sign of it falling back to the level seen at the turn of the millennium, when it was less than 9 per 100,000, let alone the level seen in the 1980s which was lower still. This may seem paradoxical because we are drinking less than we did at the turn of the millennium and about the same as we did in the 1980s. It is not just the number of people consuming more than 14 units a week that has been falling. Per capita consumption fell sharply in the UK between 2005 and 2013 and, although it has ticked up slightly since 2014, it remains 16 per cent lower than it was at its peak. Per capita alcohol consumption has been at 1980s levels for the whole of this decade and yet the alcohol-related death rate has been much higher. The rate has barely moved since 2005, except in Scotland where there was a sharp downturn between 2006 and 2012. The empirical evidence for this theory with regards to alcohol came from the observation that per capita consumption and alcohol-related deaths rose and fell in tandem in some societies. This can be illustrated by looking at Finland where the relationship between the two variables has been strong for several decades. Note that there is almost no time lag. Unlike smoking, which causes lung cancer rates to peak many years after cigarette sales peak, liver cirrhosis rates have been seen to fall almost immediately after alcohol sales fall. Rose gave a striking example of this in his book, with a graph showing liver cirrhosis rates plummeting during World War II and, to a lesser extent, World War I. (Rather naughtily, Rose started the y-axis at 5, but the effect is still clear). Compelling though this evidence may seem at first glance, it cannot be reliably inferred that a decline in per capita consumption causes a decline in heavy drinking and, therefore, liver cirrhosis. It is at least as likely that the causation runs the other way, which is to say that a decline in heavy drinking leads to a fall in per capita consumption. As anti-alcohol campaigners never tire of reminding us, heavy drinkers consume a very large share of a nation’s alcohol. In the UK, for example, four per cent of drinkers account for 30 per cent of alcohol consumption. Other countries can boast similar ratios. Heavy drinkers consume such a large proportion of the alcohol that any reduction in their numbers will have a marked impact on overall consumption, regardless of what the average drinker consumes. The single distribution theory is therefore flawed in principle. Prima facie evidence from countries like Finland does not prove that it is overall consumption, rather than heavy drinking, that holds the key to reducing alcohol-related mortality. Rates of mortality are not dictated by overall consumption, nor does the former necessarily follow the latter. In the USA, for example, rates of liver cirrhosis decline in the 1970s while alcohol consumption rose, and peaked a decade before per capita consumption peaked. For all its shortcomings, the single distribution theory greatly appeals to the temperance and ‘public health’ lobbies. It provides a theoretical justification for policies aimed at clamping down on overall consumption – raising prices, banning advertising, restricting licensing laws and so on – while absolving those who work in alcohol policy from the difficult task of dealing with alcoholics and dependent drinkers directly. As such, the hypothesis has been officially endorsed by the World Health Organisation – which insists that ‘lowering the population mean for alcohol consumption will also predictably reduce the number of people suffering from alcohol abuse’ – and has become official policy in Scotland where the government explicitly takes a ‘whole population approach’. And yet the British experience over the last fifteen years patently contradicts the theory. In The Strategy of Preventive Medicine, Rose predicted that a ten per cent decline in per capita alcohol consumption would lead to a 25 per cent decline in heavy drinking. He did not define what he meant by heavy drinking, but if we use alcohol-related mortality as a proxy (it is, after all, the outcome that ‘preventive medicine’ is trying to address), the facts from Britain show that a 16 per cent decline in per capita consumption over a twelve year period had essentially no impact on mortality. The UK rate for alcohol-specific deaths is at its third highest on record and, as we have seen, the English rate has never been higher. Even if we assume that there is a time lag of a few years for some alcohol-related diseases, these statistics are wholly at odds with the theory. Two conclusions follow from this. First, that there has been no decline in the number of people drinking at genuinely dangerous levels in the last fifteen years. Second, that the number of people drinking above the Chief Medical Officer’s guidelines tells us nothing about how many people are drinking at a dangerous level. This should come as no surprise. We know that the Chief Medical Officer’s guidelines do not reflect the risks of drinking. We might also conclude that there are no benefits to be had from reducing alcohol consumption unless it is the heaviest drinkers who are cutting down. No purpose is served by getting moderate drinkers to become light drinkers, nor by getting light drinkers to become teetotallers. This might seem obvious, but much that is obvious is denied by the philosopher kings of ‘public health’ academia. any sensible person would know, without the advantages of being a professor of epidemiology, that this “population strategy” must be fallacious. 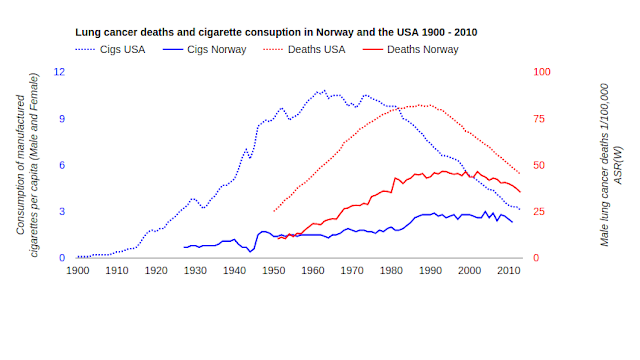 I really do not think that it is true that peak lung cancer follows peak cigarettes sales in a predictable way. in the 90s (along with pretty much every other country in the world). 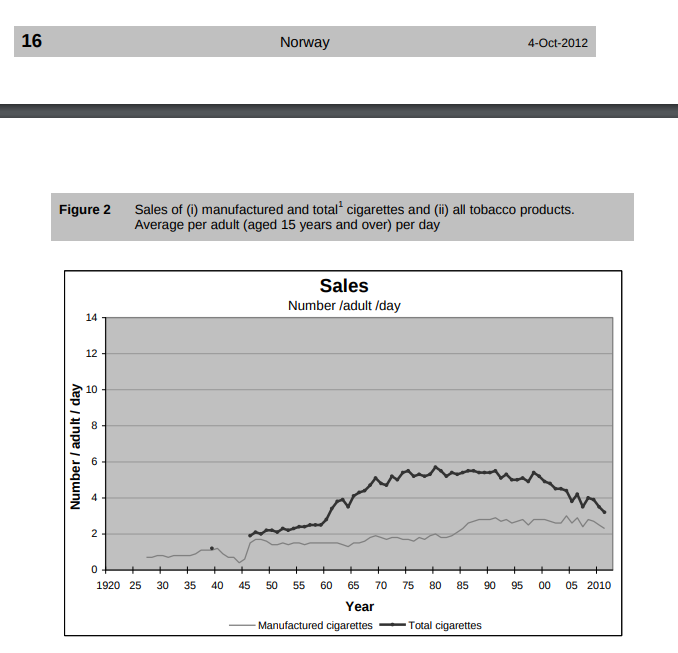 Even if you look at total cigarette sales there seems to be no evidence of a time lag in Norway. 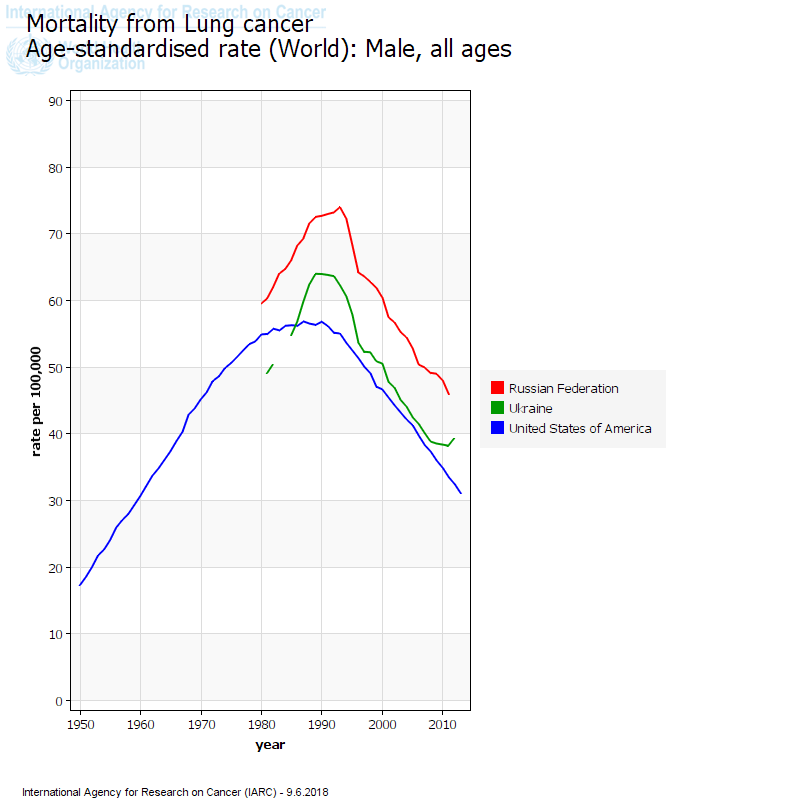 And in countries that have high smoking prevalence to this day (Russia for example) peak lung cancer occurred many decades ago in the 90s. It is a very strange example of cause and effect where the effect ends before the cause. Interesting analysis. Can a comparison can be made with road deaths: If the number of extreme drivers (cf. heavy drinkers) were to be reduced, would the average number of fatal incidents (cf. cirrhosis) per capita also fall. That is, it’s not that the average driver would be better, or that road safety campaigns are generally more effective, rather it’s the distribution would be no longer skewed by an extreme minority. I ignore them all. The function of these stats is to keep Public Health officials firmly in their place at the trough. The bar chart describing ‘UK trends in alcohol consumption’ is misleading, in that the baseline is not zero. If it were, we would see that the variations on alcohol consumption over the years are relatively insignificant. 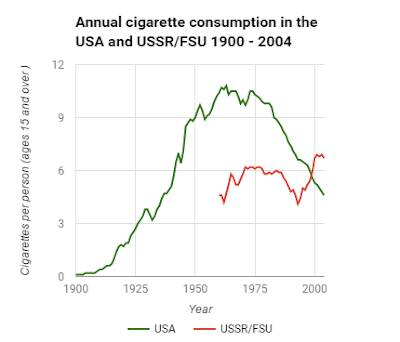 This way of presenting graphs is commonly adopted by lobby groups with a message to convey, in this case to show that the recent decline in consumption is bigger than it really is. I agree with the point and mention it in the article, but that particular graph is from the Institute of Alcohol Studies which is an anti-alcohol lobby group. A 16% drop looks pretty big however it’s displayed, to be honest.